Why Do ODE Solvers Go To Infinity Or Zero For Simple Harmonic Oscillators? So we want to solve these two. We know of course that the exact solution is x ~ cos(wt) and v ~ -sin(wt) and plotting v vs x will give you a circle, so we can use that knowledge to compare the results. 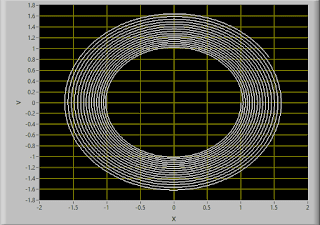 Throughout, I will set my initial values to v(0) = 0 and x(0) = 1 so that the points should lie on a circle with radius = 1 and center = (0, 0) when you plot v vs x. As you can see from the examples, the Euler algorithm blows up quickly and the 4th order Runge-Kutta trends towards zero. Why? Thinking about how that works for a circle...if you take any point on a circle, find the slope (it's the tangent line), and move either clockwise or counter clockwise, you will be closer to zero than the tangent line you found at that x value (sketch it out if it doesn't make sense). Thus, approximating the circle with the tangent line and continuously updating will always give you a slightly larger value. The longer you do this, the more that value blows up. 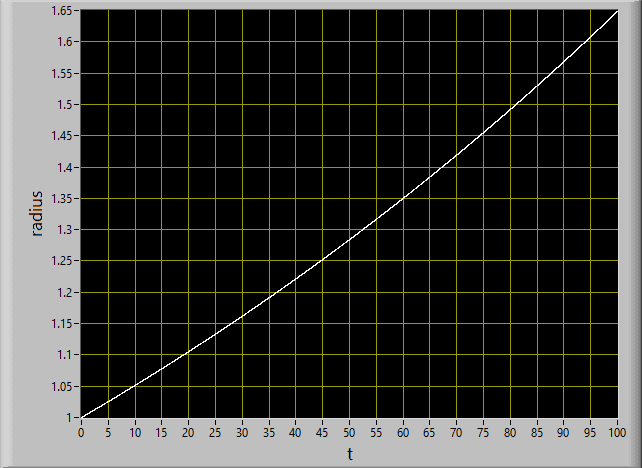 This is exactly what we saw in the LabVIEW plot above that used the Euler method. I've zoomed in on the first few iterations of a sample here so you can hopefully see what's going on. 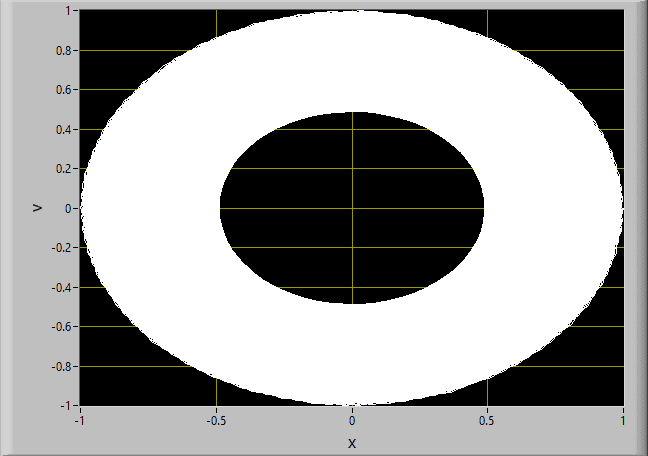 Notice that the first tangent (colored) line approximation misses a bit to the right of the circle (white). The next approximation starts with the end of the previous one so it's already high, and it misses high again making the error worse. Each iteration builds on this. Clearly, the tangent line never curves inward as fast as the actual circle does and no matter how small the step size, it will always blow up towards infinity. The 4th order Runge-Kutta is too long to explain here so I'll just link to the wikipedia article. 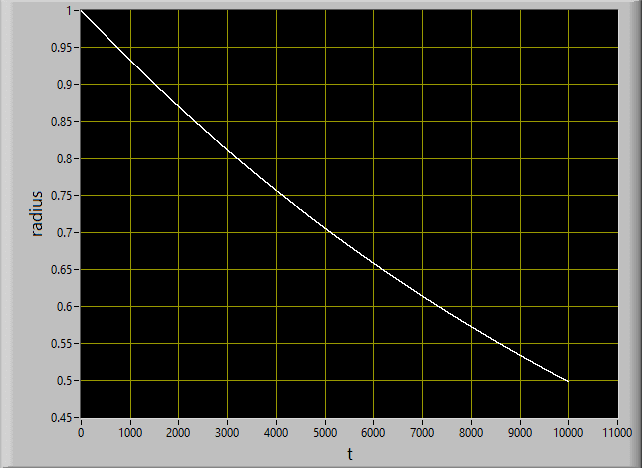 Suffice it to say though that it experiences a similar problem, except that it trends towards zero instead of infinity. 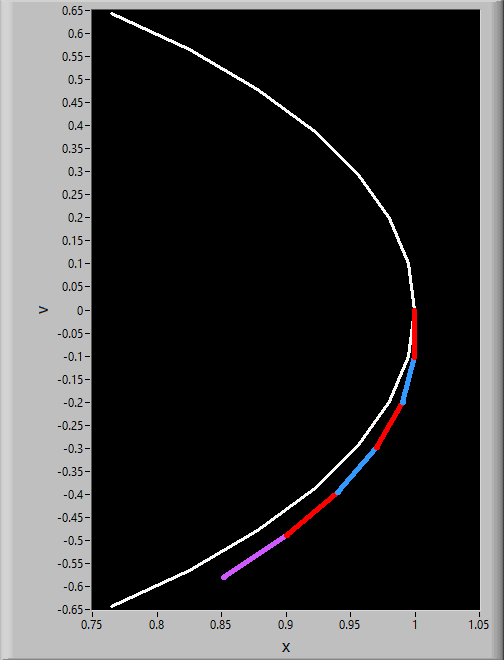 All iterative approximations like this will have errors, and with something like a simple harmonic oscillator or exponential plot that always changes in a consistent way those errors accumulate in the same direction over time. Popular solvers use variants of these, so they're subject to this issue. It is important to note that some provide ways to set maximum error and they adapt the step size to stay within that, but that's a topic for another post. Since LabVIEW is less popular than Python, I've provided a simple example in Python instead so that you can experiment with these if you want. To try this out with other differential equations, just change the definition of 'diffEQ' at the top and adjust the parameters as needed (e.g., I needed x and v here...you might just need an x, or maybe you need x, y, and z).